The asphalt on the M25 Dartford crossing's western tunnel under the trucks is pounded 24 hours a day, seven days a week, and the carriageway's 11 year old surfacing had become heavily wheel tracked and potholed. Resurfacing was required. The M25 Dartford crossing's western tunnel, and in particular this tunnel's nearside lane, takes the vast majority of heavy goods vehicles (HGVs) travelling north around London. The asphalt under the trucks is pounded 24 hours a day, seven days a week, and the carriageway's 11 year old surfacing had become heavily wheel tracked and potholed. Resurfacing was required. New asphalt needed to demonstrate good flexural characteristics (see the tunnel deck form of construction, below) and be very resistant to fatigue. It had also to display high resistance to deformation and exceptional qualities of workability at relatively low temperatures. The requirement was for an exceptional material and Endura Z2 – an extremely competent Premium polymer modified product from Nynas – was chosen as the binder. More than 150,000 vehicles a day use the Dartford crossing's northbound twin tunnels and its southbound bridge. Traffic build up is rapid and intense if any part of the crossing has to close, particularly at peak time; resulting in huge queues. For resurfacing the deteriorating deck of the western most tunnel, Connect Plus got consent from the Highways Agency to close the tunnel only at weekends, between the hours of 20.00h and 10.00h the following day, during a limited number of Friday and Saturday night possessions. In total, 14 surfacing shifts were planned for, with a nominal target of 100m of surfacing being carried out each shift - the tunnel being just over 400m long. The deck to the tunnel is made of precast concrete panels, each one 3.5m long, which rest on elastomeric bearings. HGVs running over the panels have the same effect as fingers travelling across piano keys: the deck is a 'lively' one, requiring an exceptional asphalt with good flexural characteristics, resistant to fatigue and deformation, and good workability. Endura Z2 was chosen as the asphalt binder because it melt all the requirements, including an ability to remain workable at cool temperatures. This was particularly important because the lack of headroom within the tunnel meant the surfacing contractor’s tipper trucks could not deliver asphalt straight to the paving machines. Instead the material had to be discharged at the tunnel portals, then loaded into dumpers, then delivered to the 'work face' in small quantities – at about 165°C. 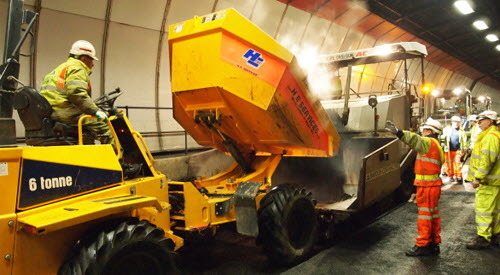 Two layers of asphalt were laid in the tunnel, the binder course comprising a 50/14 hot rolled asphalt, the surface course a 10mm stone mastic asphalt. Both are bound with Endura Z2. The resurfacing project was carried out very successfully over the 14 planned shifts, despite bitterly cold weather. Download this information on how Nynas Endura Z2 was used at Dartford Tunnel, UK, a s pdf.